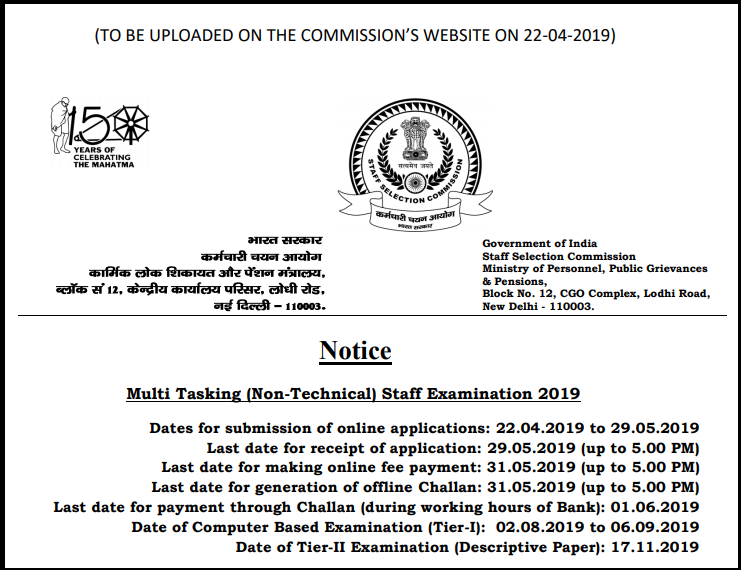 SSC MTS Recruitment: The SSC MTS 2019 recruitment notification is released today, April 22, 2019. According to the official notification, the online examination (Tier 1) will be conducted from August 2 – September 6, 2019. The descriptive exam (Tier 2) will be conducted on November 17, 2019. Furthermore, the number of vacancies is not determined but the official notice has mentioned that updated vacancies will be uploaded on the official website from time to time at ssc.nic.in-> Candidate’s Corner-> Tentative Vacancy. The last date for submitting the online SSC MTS 2019 application form is May 29, 2019 (up to 5:00 PM). The last date for fee payment is May 31, 2019 (up to 5:00 PM). Apply online now! The SSC MTS 2019 online Application Form is now available with the release of the SSC MTS 2019 recruitment notification. Candidates should note that only online registrations will be accepted. Click on “Register Now” in the Login section. Enter your Basic Details followed by Additional Details and Contact Details step by step as prompted. a.) Fill your name, father’s name, mother’s name and date of birth exactly as in your Matriculation (10th) Certificate. b.) You have to complete the registration process within 14 days else your saved changes will be deleted and you will have to start afresh. c.) After completion of the registration process, Basic Details can be changed only twice. Log in with your Registration Number and Password provided on your phone no. and email. Look for the “Apply” link in Multi Tasking (Non- Technical) Staff Examination 2019 in the Latest Notifications tab. Enter the required details as prompted and click on “I Agree” and enter the captcha code. Preview and verify the information and click on “Submit”. Pay the requisite SSC MTS Application Fee. Download your SSC MTS Application Form and take printouts for future reference. The SSC MTS Application Fee is Rs. 100/- and can be paid online through BHIM UPI, Net Banking, by using Visa, Mastercard, Maestro, RuPay Credit or Debit cards or through cash in SBI Branches by generating SBI Challan. Women candidates and candidates belonging to Scheduled Castes (SC), Scheduled Tribes (ST), Persons with Disabilities (PwD) and Ex-servicemen (ESM) eligible for reservation are exempted from payment of application fee. Online fee can be paid by the candidates up to May 31, 2019 (5.00 PM). However, candidates who wish to make the cash payment through Challan of SBI may make the payment in cash at the Branches of SBI within the working hours of bank up to June 1, 2019, provided the Challan has been generated by them before May 31, 2019 (5.00 PM). Staff Selection Commission (SSC) is yet to release the information regarding SSC MTS Recruitment vacancies. In the previous year’s SSC MTS recruitment drive, there was an increase in vacancies from 10,302 to 10,674. The expected number of vacancies for SSC MTS 2019 is 10000. Candidate must be a citizen of India or belong to Bhutan or Nepal. Person of Indian origin who has migrated from Pakistan, Burma, Sri Lanka, East African countries such as Kenya, Uganda, the United Republic of Tanzania, Zambia, Malawi, Zaire, Ethiopia and Vietnam with the intention of permanently settling in India can apply for this examination. Candidates with minimum 10th passed from a recognized university or board will be eligible. Latest update: SSC releases SSC JHT Paper 1 result. Check Here! The SSC MTS admit card will be made available on the official website of SSC tentatively in the month of August 2019. The examination constitutes of two papers, i.e., Paper 1 & Paper 2. Paper 1 questions will be objective type (MCQs). 0.25 marks will be deducted for every wrong answer and question paper will be set up in both the languages: English & Hindi. Paper 2 questions will be of a descriptive type and qualifying, comprising of Short Essay/ Letter to be written in English or any other language included in the 8th schedule of the Constitution which usually judges the candidate’s elementary language skills. Non-verbal types of questions including similarities & differences, problem-solving, decision making, non -verbal series, space visualization, visual memory, analysis judgment, arithmetical number series, discriminating observation, relationship concepts. This test will judge the candidate abilities to deal with the arithmetical computation of abstract ideas and symbols and their relationship and other analytical functions. 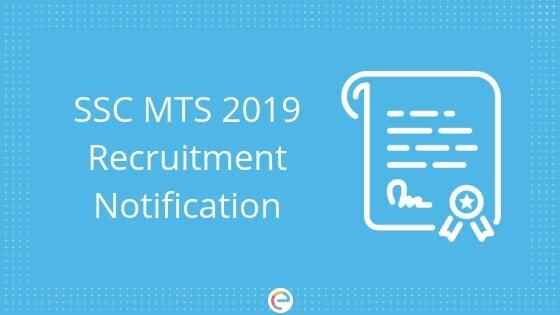 We hope this detailed article on SSC MTS Recruitment 2019 helps you in your preparation. If you have any query regarding SSC MTS Recruitment, drop a comment below and we will get back to you.